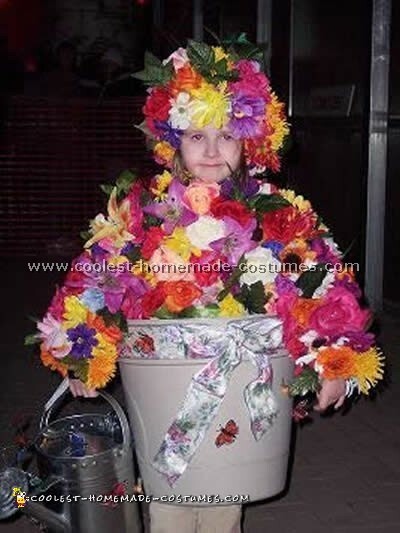 This flower costume came together at the last minute. I was really hoping to find a really cute lady bug costume and I happened to find a flower costume marked down for about $10 at Burlington Coat Factory and thought I would have it as a backup and if I didn’t use then I would return it. A couple of days before our church’s Harvest Festival my mother and I ran out to Big Lots to get some candy. We just happened across the really cute bendy flowers with happy faces and it sparked a memory of a picture I had seen a long time ago of a small kid dressed like a flower and she had a pot around her waist with holes cut out for the legs (I don’t know how she got it to stay unless it was hidden suspenders). The flowers were no more than $2 a piece and we bought five all in different colors. In the same shopping center is Trees and Trends and we found that really nice light-weight resin pot for under $20. We bought a large piece of brown felt for the dirt (which was also used as a blanket) and a couple of lady bug decals to glue on the petals. My daughter was almost five months old and she never fussed while she was in the pot. She actually took a long nap in it. It also helped that she had her favorite crinkle toy with her which was a really cute winged bug (bought it a couple of months prior at Kohls). We had so many compliments and several people wanted to take her picture. I was asked a few times if she was supposed to be an Anne Geddes baby. That had never occurred to me until I looked at some of her pictures. I wish I could get her to wear this flower costume again. I loved seeing all the smiles and hearing the “ahhhh” or even the chuckles when people walked by her. Daisies are my all time favorite flower, inexpensive and sweet. 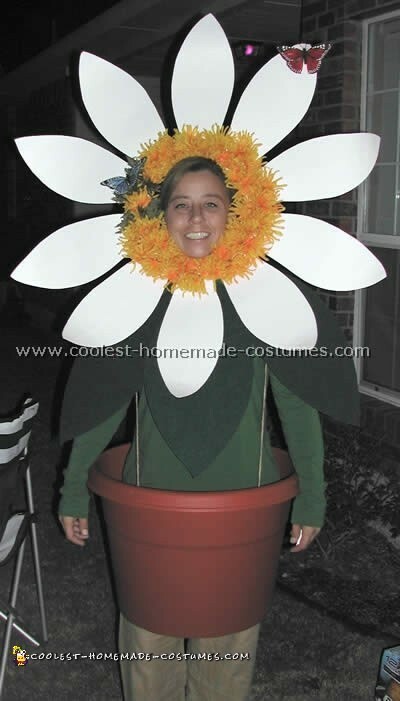 As a joke to all my friends who are always buying me daisy paraphernalia last year I made this homemade flower costume. I started out with a cardboard circle cut like a doughnut to fit my face, poster board petals with floral wire hot glued to the back of each one [so I could bend them], silk flowers and a plastic terra cotta pot. I adorned my petals with little silk butterflies from the craft store along with some leaves made from hard felt material [also purchased at the craft store] which I pinned to the neck line of an old green t-shirt I had lying around. As a bonus I dressed my husband in coordination as Jose the Gardner. He wore an old t-shirt that I ironed on a decal I made on my computer with a daisy logo, of course. He also wore an old tool belt, a left over hat we had from another party and another year an old watering can I found in my potting shed [which he proudly drank his evenings beverages out of]. To finish it off, he took an old basket filled with silk daisy’s that I was about to throw away and there you have it, Daisy and the Gardner! 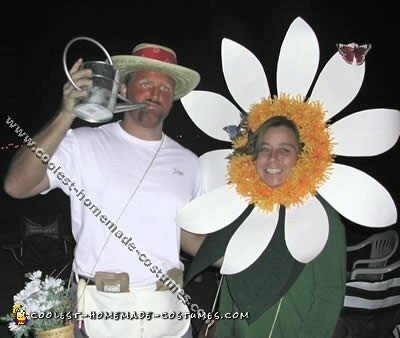 We wore that same flower costume and Gardner to three different parties and not only did we win our first costume contests ever we won that award at all three parties. Have fun! 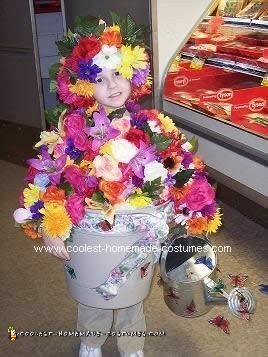 My daughter wanted to be a Flower Garden for Halloween so I went ahead and made her a flower costume. I went to the thrift store and bought green stretch pants and an adult medium green sweatshirt. I cut the sleeves to her arms length. Then, I purchased as many fake flowers as the thrift store had. I bought a couple of fake leafy plant vines at a different local store. Then I just laid out the sweatshirt and got some yarn and a yarn needle. I cut a few 8” pieces of yarn and basically just tied the vine all over the sweatshirt. Then, I tucked in and tied the flowers. I took a flowered wreath for a centerpiece (from the thrift) and tied flowers to the top of that. I actually found a couple of clip flowers (for hair I think?) and used those to secure a small vine chin strap to the wreath cap (a ribbon tied to the wreath would work too). When you assemble the wreath hat it should be upside down so the flowers and leaves frame the face, just fill the top of it. 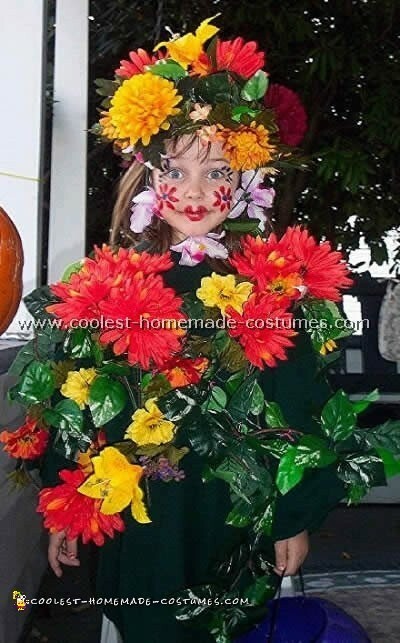 To top off this flower costume I simply face painted flowers on the cheeks and made little heart lips. It really turned out cute. This year my daughter wanted to be a flower pot so I went and bought a ton of summer fake flowers and hand sewed all of them on to a sweat shirt. Then, I hand sewed them onto an old winter hat and bought a flower pot and cut out the bottom of it. I hot glued on some craft butterflies, bees and ribbon onto it. Using some duct tape, I attached some Velcro and some metal binder rings to the inside of the flower pot. This way I could attach some suspenders onto so it would hold it up. I then bought a metal watering can and hot glued some more craft butterflies and bees onto it. This was her trick or treat bucket. 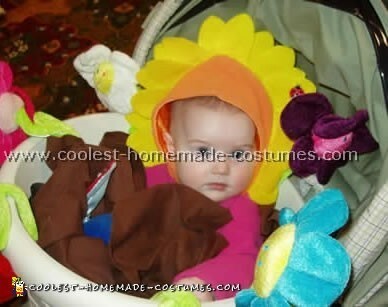 My daughter got so many compliments on her flower costume and she had a blast in it! 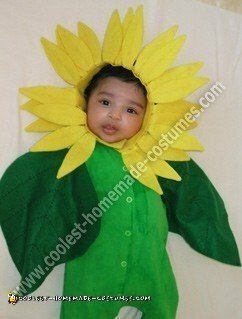 I made a sunflower costume for my then 2-month-old baby. Since my daughter was still a very young infant I wanted to make something that was completely removable so that she was very comfortable. I decided to go with a sunflower with the leaves and the flower completely removable and attachable in a minute. The stem of the flower is a cotton bodysuit that I purchased in a light green. Since the green was not appropriate for a stem, I repainted it with a brighter green using fabric paint. I drew the leaves freehand on green color felt and cut them out. I hand-stitched the veins on the leaves with a darker green. The leaves were then attached to the hands of the bodysuit with Velcro. This made the leaves removable and re-attachable in a jiffy. The head of the flower was made with yellow felt material. I cut out a long strip of the felt material. The length was enough to go over my daughter’s head and under the chin with a couple of inches to spare. The two ends of the material were attached with Velcro. I then cut out the petals of the flower freehand. Every petal was made with two layers of felt with florists wire in-between. This gave the petals stiffness and let me shape the petal to give it a more natural look. I then attached the petals of the flower costume next to each other on the long strip of felt. 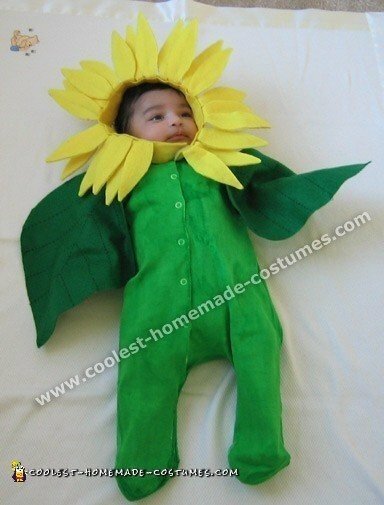 This could be attached around my daughters face to become the flower head. All the pictures show the same flower costume. The shades of yellow look different because they were taken in different places and different lighting conditions. 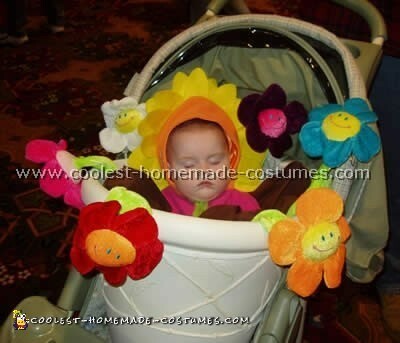 This costume was easy to make and turned out perfect for a 2-month-old baby girl.